Visual Art: Realism: Avant-Garde: Larionov's "Rayonnist Composition"
In 1913, Larionov and Goncharova developed what may have been the first original Russian school of non-objective painting, Rayonnism. According to the first Rayonnist manifesto, written by Larionov and Goncharova in 1913, "The style of Rayonnist painting that we advance signifies spatial forms which are obtained arising from the intersection of the reflected rays of various objects, and forms chosen by the artist's will. The ray is depicted provisionally on the surface by a colored line. That which is valuable for the lover of painting finds its maximum expression in a rayonnist picture. The objects that we see in life play no role here, but that which is the essence of painting itself can be shown here best of all--the combination of color, its saturation, the relation of colored masses, depth, texture." (for a full text, see Bowlt, pp. 87-91). 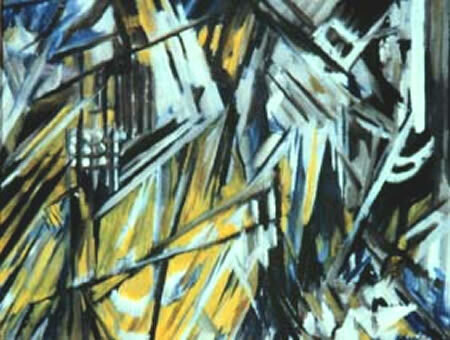 Like cubism, however, the non-objectivity of rayonnism initially grew out the analytic deconstruction of real objects, evolving gradually into pure abstraction, as in this composition of Larionov which probably dates from 1913.